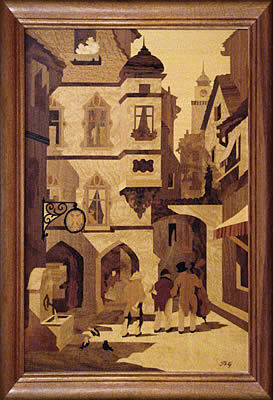 March's update brings us a new selection of Buchschmid and Gretaux wood inlay titles for you to study and enjoy. 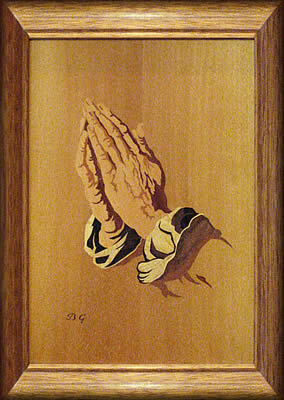 We also have a further copy of the Praying Hands picture that will help you to establish the differences found between copies of the same picture when produced in marquetry. Check out page 20 for the other copy. This March 2010 update brings you a rather unusual subject in the Buchschmid and Gretaux catalogue. The wood inlay picture you see on the right is entitled "Kogge" and it features a Pirate ship which operated in the Baltic sea. 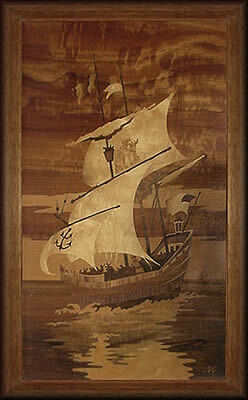 This is the first Buchschmid and Gretaux Sailing / Rigged or Pirate ship inlay picture we have seen. This subject does not appear in the usual listings, and therefore we were at a bit of a loss in identifying it. But a quick conversation with our very good friend and advisor, Herr Otto Chlup of ABC Studios Heildelberg, and this anomaly was instantly cleared up. "These “Pirate” ships known as “Kogge” were originally used by the medieval trade alliance of Germanic, Scandinavian and Baltic States as the precursor to the Galleon. These ships had a form of castle embellishment front and rear which was later adapted for use on the soon to follow Galleons. The Kogge ships made use of a triangular shaped ‘Lateen’ sail for steering purposes; again, this was later adapted for use on the Galleons. Arab Dows also frequently used this sail as it helped greatly when sailing against the oncoming wind. The Nordic ‘Knar’ which was a common style of flat bottomed boat, provided the basic inspiration for the Kogge from which, of course, it was adapted. Along the Hague (in the Netherlands), these form of flat bottomed boats can still be found used as fishing boats in places where there are no harbouring facilities. They can be sailed up the beach at high tide for mooring. In the Netherlands they are often referred to as ‘Boms’." Our other two B & G pictures featured this month are not the regular ones we are used to seeing. 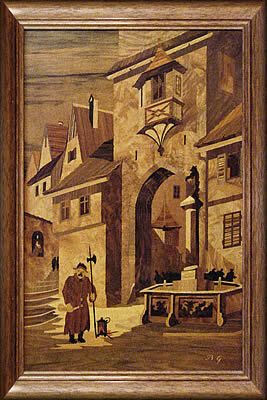 Again, Otto has identified the pictures and the titles are included in the text below the pictures themselves. Our thanks to April Schow for sending them in to us. They are excellent examples of the B & G workmanship. You probably will remember those delightful coffee tables (actually, a set) which we featured on page 14. Well, we've had an inquiry sent in by Mary Harrington asking if the coffee table set was ever supplied with perfectly shaped glass tops? We once again asked our good friend Otto (of ABC Studios) if he knew the answer to this and he told us that, yes indeed, those coffee tables were supplied with shaped glass tops. In fact those glass tops were made by a colleague in Heidelberg to initially protect the tables during transport. If those original perfectly shaped glass tops have survived on Mary's coffee tables, then they have done their job remarkably well and are still there protecting those beautiful surfaces to this day! We wonder if any others of those original glass tops have survived? Or is it just possible that Mary has a unique set of B & G Coffee Tables? Do let us know if you also have a set of these coffee tables with the original glass tops still intact. Thanks. Click the above button to return to page 23 of "Can You Help"
Click the above button to visit page 25 of "Can You Help"